In the famous Hans Christian Anderson fable, The Emperor’s New Clothes, a weaver famously plays on an emperor’s arrogance and persuades him to wear a non-existent suit with the argument that it is only invisible to the ‘hopelessly stupid’. The moment of truth comes, as we can all remember, when a child in an otherwise silent crowd yells out, “But he is not wearing any clothes!” What we don’t always recall is that the naked Emperor suspects the child may be telling the truth, but carries on marching proudly and unclothed regardless. The story is a rather apt parallel for the Cancún climate agreements that were signed last week. Only one dissenting nation, Bolivia, dared to voice its dissent with the agreement. Yet their voice was silenced by the gavel of the Chair and by the standing ovations of 191 countries. They, like the naked Emperor, must know that the deal is naked and without substance, yet they march on proudly regardless. To a stony silence from fellow country negotiators, Solon also pointed out a whole range of critical flaws in the agreement from its complete lack of specifics on key issues of finance to its systematic exclusion of voices from developing countries. As a press statement from Bolivia put it: “Proposals by powerful countries like the US were sacrosanct, while ours were disposable. Compromise was always at the expense of the victims, rather than the culprits of climate change.” Solon concluded that in substance the Cancún text was little more than a rehashed version of the Copenhagen Accord, that had been widely condemned the year before. Patricia Espinosa, chair of the talks, refused to open up any points of her draft text for negotiation and cheered on by other delegates made the legally dubious ruling that Bolivia’s opposition did not block consensus. The Cancún agreements were ‘approved’ to great celebration from the international community. However this argument supposes two things: firstly that progress, even if small, was made at Cancún and secondly that it is better to have some kind of agreement than none at all. This reasoning along with both the financial offers, cajoling and bullying of the major powers – which was revealed most dramatically in wikileaks cables – is no doubt what drove most government negotiators to sign the Cancún texts. Yet both suppositions are highly questionable. Firstly in terms of analysing progress, aside from the many other critiques of the texts, there is strong evidence that the Cancún agreements take us backwards rather than forwards. One of the key characteristics of the otherwise wholly insufficient Kyoto Protocol is that it had legally binding targets based, in theory, on the science. 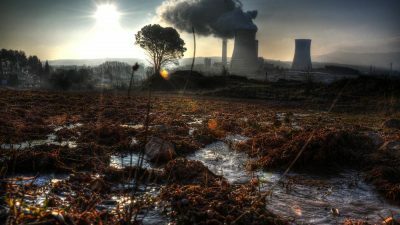 As we come up to the first deadline of 2012, seventeen nations will almost certainly breach their commitments to reduce emissions by 2020 by 5 per cent compared to 1990. Some nations like Canada, Australia, Turkey and Spain have instead vastly increased emissions. However the fact that they signed legally binding targets does open up the possibilities of legal challenges and a more effective incentive in future for countries to abide by their commitments. By contrast, the Cancún agreement effectively kills off the Kyoto Protocol and replaces it with a pledge system of voluntary commitments. Not only does this lead to countries only offering what they plan to do anyway, ignoring what science demands; there is absolutely no possibility of legal penalties if a country fails to fulfil its commitments. It is an ineffective and highly dangerous way of tackling one of the biggest crises humanity has faced. The second questionable supposition is that any agreement is better than no agreement. This may be true for some international discussions on less critical issues, but is it for discussing a climate crisis where urgent and radical action is the only way to avert runaway climate change? As even supporters of the Cancún agreement note, the text has mainly punted off most difficult decisions to the next meeting of the UNFCCC in Durban, South Africa in December 2011. It already seems likely that we will see a repeat of the hype built up around Copenhagen and the equal likelihood of either a fudge or a failure – particularly if delegates can seem so easily sated by a few symbolic gestures such as the ones in Cancún. Meanwhile the window of opportunity to act is closing. One report by the London School of Economics suggested that greenhouse gas emissions will have to peak by 2015 to have even a 50 per cent probability of keeping temperature increases below 1.5 degrees celsius – the demand made by over 100 developing nations. The Inter-Governmental Panel on Climate Change similarly identified 2015 as a time when emissions will have to peak to stabilise atmospheric CO2 at levels of 350 to 400 parts per million. Yet in the face of this, the best the world community can come up with is an agreement to continue negotiating? And we are happy to call that a success? As a side note, it can only be seen as deeply cynical that industrialised countries in Cancún agreed on 2015 as the date to review whether the global target should be 1.5 degrees rather than 2 degrees given that any action after that will almost certainly be too late. The truth is that Cancún revealed a shocking failure by the world’s nations – and particularly those most responsible for causing climate change – to find a collective and effective response to a crisis that will affect the most vulnerable. 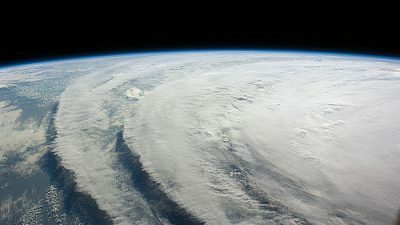 A report by the Climate Vulnerable Forum, in December 2010 noted that already 350,000 people die from natural disasters related to climate change and that this figure is likely to rise to one million people every year if we don’t radically change course. Bolivia was not an obstacle to progress, it was rather the only nation daring enough to tell the truth. Perhaps if more nations – especially major emerging economies like India and Brazil – had said they would not accept an illusory deal, it could have shocked the world into moving beyond cautious approaches and acting radically for humanity and the planet. The shift in thinking and action which is needed though, will only happen if we mobilise and on a scale that has never been done before. Bolivia’s bravery came to a large degree from the mandate it received at the World Peoples’ Conference on Climate Change, and the support it felt from people on the streets just a few blocks from the negotiating halls. 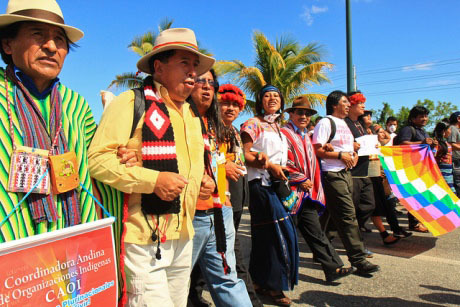 There thousands of indigenous people, smallholder farmers and grassroots activists marching on the streets were unequivocal in condemning the Cancún agreements and in supporting Bolivia. They already see the costs of climate change and were not prepared to be bought off with a deal that did nothing to safeguard their future. They were backed by climate justice networks worldwide. Yet the isolation of Bolivia in the conference plenary shows that this movement faces a huge challenge in the coming year to scale up. As Bill McKibben, founder of the global campaign 350.org, argues we need to “build a movement strong enough to take on the most profitable and powerful enterprise that the human civilization has ever seen – the fossil fuel industry” and we need to do it urgently before it is too late. 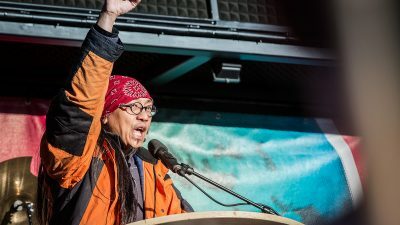 Systematic exclusion of proposals that came from the historic World Peoples’ Conference on Climate Change including proposals for a Climate Justice Tribunal, full recognition of indigenous rights, and rights for nature. This article was originally published by Red Pepper partner the Transnational Institute.